Awana has been helping churches and parents raise children and youth to know, love and serve Christ for more than 50 years. Each week, nearly 2 million kids take part in Awana worldwide through more than 26,000 churches. Whether it's through Bible verse memorization drills or crafts, Awana helps children build their faith in Christ on a solid biblical foundation, enabling them to face the tween and teen years through a strong Christian walk. 92.7 percent of Awana alumni continue to regularly attend church as adults, and only 1.8 percent said they had dropped out of church since high school, according to an Awana alumni survey conducted in 2007. Awana recently announced a partnership with Crossway to release a newly updated ESV (English Standard Version) curriculum. I recently reviewed the Cubbies (preschooler) kit you see pictured above. Here are some highlights that stood out to me. Appleseed Teaching Cards - beautifully illustrated these teach vital topics such as God is our Creator, God's Word is Truth, God Keeps His Promises, and more. It also comes with PDFs that you can use to project the images for large format viewing. The student books do an excellent job in partnering with parents to extend the lessons and memory verses into the home. Each lesson equips parents to lead their children spiritually through hands on activities, discussion starters, and a CD. The leader shirts are comfortable and will be appealing to your volunteers. The kids' shirts have the "fun" factor that your preschoolers will love. There are great tools that leaders can use to connect with kids and parents including birthday cards, postcards, and more. Kids love puppets and there are 3 puppets included to capture kid's attention. I love gadgets and this kit has one of the coolest I've seen in awhile. It's a fan that lights up and shares the gospel when you turn it on. 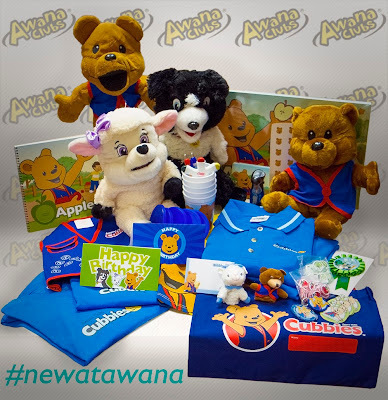 My friends at Awana will be giving away a kit to one of our readers. This is a $300 value. You can enter by emailing me (dalehudsoncm2@gmail.com. I will announce the winner next Friday, August 16, here on this site. Here's a promo video with more information about this great new resource.